Study of some cord blood markers as early predictors of neonatal sepsis. 1Department of Pediatric, Faculty of Medicine, Tanta University, Egypt. 2Department of Clinical Pathology, Faculty of Medicine, Tanta University, Egypt. Study of some cord blood markers as early predictors of neonatal sepsis. This prospective casecontrol study was conducted on 85 neonates who were followed up in the Neonatal Intensive Care Unit (NICU) from June 2016 to December 2017. Studied neonates are divided into 3 groups: Group 1 (Control) are 10 cases in which cord blood level of IL 6 and IL 8 are normal at birth and (C-Reactive Protein) CRP was negative at birth and still negative after 3 days. Group 2 (Suspected) are 45 cases in which cord blood level of IL 6 and IL 8 are elevated at birth and CRP was negative at birth then become positive after 3 days. Group 3 (Infected): are 30 cases in which cord blood level of IL 6 and IL 8 are elevated at birth and CRP was positive at birth and still positive after 3 days. There was significant increase in suspected, infected groups as compared to control group as regard CRP with P-Value 0.001*. The level of IL-6 is significantly higher in suspected, infected group than control group with P-Value 0.001*. The level of IL-8 is significantly higher in suspected, infected group than control group with P-Value 0.001*. The IL 6 and IL8 are more sensitive than CRP in early prediction of neonatal sepsis so we conclude that IL 6 and IL8 levels should be done for early detection of neonatal sepsis which will lead to early diagnosis of neonatal sepsis with early treatment and subsequent better prognosis. Neonatal sepsis is a clinical syndrome of systemic illness accompanied by bacteremia occurring in the first twenty eight days of life . Neonatal sepsis is classified according to the time of onset of the disease into Early Onset Sepsis (EOS) and Late Onset Sepsis (LOS). EOS disease is mainly due to bacteria acquired before and during delivery mainly from the mother where LOS disease to bacteria acquired after delivery (nosocomial or community acquired infection) . Neonatal septicemia is a critical disease in neonate. Its incidence is still high in spite of good progress in the recent treatment modalities . There are multiple maternal and neonatal factors that have been identified that are associated with an increased risk of neonatal infection . Neonatal factors includes prematurity and invasive procedures , while maternal factors includes intrapartum fever, prolonged rupture of membrane >18 h, chorioamniontis . Most infant with septicemia are presented with non– specific signs and symptoms including poor suckling, poor activity and not doing well , so neonatal sepsis is considered as a diagnostic dilemma as the presentation is non-specific and there is no single reliable test for the early confirmation of definite sepsis . Interleukin-6 (IL -6) is a glycoprotein produced mainly by some phagocytes, endothelial cells and fibroblasts [9,10]. It is one of the cytokines that some studies suggest that this is a novel, reliable biomarker which is increased in early and late onset sepsis [9,10]. The concentration of IL-6 increases rapidly after the onset of bacteremia in fullterm and preterm neonates, but its half life is short . Interleukin-8 (IL-8) is proinflammatory cytokine produced mainly by monocytes, macrophages and endothelial cells. It increases early in the course of neonatal sepsis . Humoral and cellular immune systems are activated in the first few hours of neonatal sepsis, various molecules such as Interleukin-6 (IL-6), and IL-8 are released in the serum immediately after activation of humoral and cellular immune system which mediated the host response to bacterial infection. IL-8 regulates the migration and activation of leukocytes, whose level evaluate promptly within 1-3 h of infection and its half-life is less than 4 h [12,13]. Some studies suggest that IL-8 is an early and reliable biomarker which is increased in early and late onset sepsis [12,13]. This prospective case-control study was conducted on 85 neonates delivered in Obstetrics and Gynecology department, Tanta University Hospitals and followed up in the Neonatal Intensive Care Unit (NICU) in the same hospital, during the period from June 2016 to December 2017.The neonates were selected for this study on the basis of standard risk factors for neonatal sepsis. This study was conducted after taking a written consent from parents of each studied groups. Group 1 (Control) are 10 cases in which cord blood level of IL 6 and IL 8 are normal at birth and CRP was negative at birth and still negative after 3 days. Group 2 (Suspected) are 45 cases in which cord blood level of IL 6 and IL 8 are elevated at birth and CRP was negative at birth then become positive after 3 days. Group 3 (Infected) are 30 cases in which cord blood level of IL 6 & IL 8 are elevated at birth and CRP was positive at birth and still positive after 3 days. 1. Any risk factor for neonatal sepsis. 2. Any symptoms and signs suspected for neonatal sepsis. All blood samplings and all needles was used were disposed according to standard protocols of infection control policy . 1) 3 mL of patients’ blood was taken on Serum Separator Tube (SSR) and allowed to clot before centrifugation for 15 min. Serum was separated and stored according to stability for Interleukin-6 (IL 6) and Interleukin-8 (IL 8) at-20 degree centigrade for 90 days. N.B:-Repeated freezing and thawing was avoided as this may result in IL6, IL8 denaturation, and a contaminated specimen was discarded. 2) One milliliter of patients’ blood was taken on Ethylene Diaminetetra-Acetic acid (EDTA) tube and assayed immediately for Complete Blood Picture (CBC) with differential leucocytic count by automated way. 3) One milliliter of patients’ blood was taken on Serum Separator Tube (SSR) and allowed to clot before centrifugation for 15 min. Serum was separated and assayed for CRP. A positive result is indicated by obvious agglutination pattern of the latex in a clear solution. It will be obtained at a CRP serum concentration ≥ 6 mg/L. A negative result is indicated by no change in the latex suspension on the test slide. It will be obtained at a CRP serum concentration <6 mg/L. Serum level of IL 6 in samples was detected by ELISA using enzyme immunoassay technique. Booster’s human IL-6 ELISA kit was based on standard sandwich enzyme-linked immune-sorbent assay technology. Monoclonal antibodies from mouse specific for IL 6 have been precoated onto 96-well plates. Standards for IL 6 (E.Coli, P29-M212) and test samples are added to the wells, abiotinylated detection polyclonal antibody from goat specific for IL 6 is added subsequently and then followed by washing with PBS or TBS buffer. Avidin- Biotin-Peroxidase complex was added and unbound conjugates were washed away with PBS or TBS buffer. HRP substrate TMB was used to visualize HRP enzymatic reaction. TMB was catalyzed by HRP to produce a blue color product that changed into yellow after adding acidic stop solution. The density of yellow is proportional to the human IL 6 amount of sample captured in plate. Serum level of IL 8 in samples was detected by ELISA using enzyme immunoassay technique. Booster’s human IL-8 ELISA kit was based on standard sandwich enzyme-linked immune-sorbent assay technology. Monoclonal antibodies from mouse specific for IL 8 have been precoated onto 96-well plates. Standards for IL 6 (E.Coli, S28-S99) and test samples are added to the wells, abiotinylated detection polyclonal antibody from goat specific for IL 8 is added subsequently and then followed by washing with PBS or TBS buffer. Avidin- Biotin-Peroxidase complex was added and unbound conjugates were washed away with PBS or TBS buffer. HRP substrate TMB was used to visualize HRP enzymatic reaction. TMB was catalyzed by HRP to produce a blue color product that changed into yellow after adding acidic stop solution. The density of yellow is proportional to the human IL 8 amount of sample captured in plate. Cord blood was collected from 85 newborn babies. Cord Blood CBC, Blood Culture, CRP, IL-6 and IL-8 were measured at birth and CRP was measured serially every 3 days from venous blood. Group 1 (Control) are 10 cases in which cord blood level of IL 6& IL 8 are normal at birth and CRP was negative at birth and still negative after 3 days. Group 2 (Suspected) are 45 cases in which cord blood level of IL 6 & IL 8 are elevated at birth and CRP was negative at birth then become positive after 3 days. This Table 1 showing that PROM is the most common risk factor of neonatal sepsis among 3 groups then meconeal stained amniotic fluid then maternal hypertension and diabetes mellitus. The Table 2 shows comparison between suspected, infected and control group as regard gestational Age (G.A). In suspected and infected groups the range of G.A is (30-40) ws and Mean ± SD (33.96 ± 2.69) in suspected group and mean ± SD (34.70 ± 2.29) in infected group. In control group the range of G.A is (35-39) ws and Mean ± SD (36.70 ± 1.34). This result means Early Onset Sepsis (EOS) is more common in Pre Term (P.T) than Full Term (F.T) with P value 0.007*. Meaning that Gestational age is an important risk factor for Neonatal Sepsis (NS). The Table 3 shows comparison between suspected, infected and control group as regard CRP at birth. As regard CRP, in suspected group the range of CRP was (6-12) (mg/L) and Mean ± SD (8.74 ± 2.36). In infected group the range of CRP was (12-48) (mg/L) and Mean ±SD (31.57±10.65). In control group the range of CRP was (0-4) (mg/L) and Mean ± SD (2.12 ± 1.53). There was significant increase in suspected, infected groups as compared to control group as regard CRP with P-Value 0.001*. This Table 4 shows comparison between suspected, infected and control group as regard IL 6 level. In suspected group the range of IL-6 was (142-930) pg∕mL and Mean ± SD (350.56 ± 223.22). In infected group the range of IL 6 is (65-930) pg∕mL and Mean ± SD (325.47 ± 194.25). In control group the range of IL-6 is (44-100) pg∕mL and Mean ± SD (71.20 ± 18.65). This result means the level of IL-6 is significantly higher in suspected, infected group than control group with P value 0.001*. The Table 5 shows comparison between suspected, infected and control group as regard IL-8 level. In suspected group the range of IL-8 is (160-2700) pg∕mL and Mean ± SD (1064 ± 793.51). In infected group the range of IL-8 is (60-2700) pg∕mL and Mean ± SD (924.67 ± 731.01). 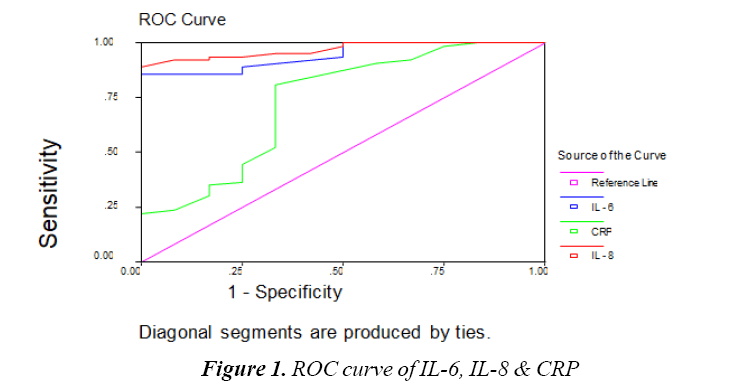 In control group the range of IL 8 is (57-116) pg∕mL and Mean ± SD (85.70 ± 22.23).This result means the level of IL-8 is significantly higher in suspected, infected group than control group with P value 0.001*. The Table 6 shows correlation between IL-6, IL-8 and CRP. There is Positive significant correlation between CRP & IL-6 in suspected & infected groups. There is positive significant correlation between CRP & IL-8 in suspected & control groups. The Table 7 shows correlation between IL-6 & IL-8. There is Positive significant correlation between IL-6 & IL-8 in suspected & control groups. The Table 8 and Figure 1 show Cutoff values & Comparison between IL-6, IL-8 and CRP as regard sensitivity, specificity, Positive Predictive Value and Negative Predictive Value. Cutoff value of IL-8 IS 120 pg/ mL, Cutoff value of IL-6 110 pg/mL and Cutoff value of CRP 6 mg/L. IL-8 sensitivity was 98%, specificity 90%, positive predictive value 97%, negative predictive value 95%. IL-6 sensitivity was 95%, specificity 80%, positive predictive value 94%, negative predictive value 84%. CRP sensitivity was 54%, specificity 70%, positive predictive value 85%, Negative Predictive value 31%. This means IL-6 and IL-8 are highly sensitive and specific in prediction of Early Onset Sepsis (EOS) than CRP. Neonatal sepsis is a major cause of morbidity and mortality in neonates despite the use of modern antibiotics and adjuvant therapies. So, early diagnosis and treatment is associated with better prognosis and outcome . IL-6 is a slightly small, glycosylated, protein produced by a group of cells including, endothelial cells, T-cells, B-cells, macrophages, monocytes and fibroblasts . Interleukin 8 is a proinflammatory cytokine which is produced mainly by monocytes, macrophages and endothelial cells. It rises early in the course of neonatal infection by activating T cell, neutrophil and basophil [10,16]. CRP is a member of the pentraxin family of proteins, which are nonspecific, acute phase proteins composed of five identical 23-kDa polypeptide subunits arranged in acyclic pentameter shape . Serum CRP becomes readily detectable 6-12 h after the onset of infections and consider one of the most sensitive indicators of an acute phase reaction and neonatal septicemia . This study was designed to investigate whether cord blood levels of Interleukin-6 and 8 are useful markers in the diagnosis of early neonatal sepsis. In this study, there are several risk factors for neonatal sepsis the most common is PROM, maternal fever, diabetes, meconium stained amniotic fluid. This is agreeing with a study which found that PROM is an important risk factor for neonatal sepsis . In this study, there was association between gestational age and neonatal sepsis. This result means EOS is more common in preterm than full term with P value 0.007* which means that gestational age is an important risk factor for neonatal sepsis and this is agreed with Stoll 2007 who found that prematurity could lead to increase in the incidence of N.S . According to IL-6 results in this study we found that the level of IL-6 is significantly higher in suspected, infected group than control group meaning there is significant difference between suspected ,infected and control group as regard IL 6 with P value 0.001*. It is agreement with other studies who found high levels of IL 6 in the neonates with infection compared with patients with non-infectious diseases [21-24]. Some studies found elevated IL 6 in CB and PB at 24 h and 48 h of life in newborns with infection . In this study, IL-6 cutoff value 110 pg/mL, sensitivity was 95%, specificity 80%, positive predictive value 94%, negative predictive value 84%, so it can be used as a predictor for early diagnosis of neonatal sepsis. IL 8 is a chemotactic factor that acts on neutrophils that accumulate in the site of infection. Both placental cells and fetal monocytes∕macrophages are able to increase its production after an infectious process originated in the uterus . In this study, the result means the level of IL-8 is significantly higher in suspected, infected groups than control group with P value 0.001*. In agreement with my study some studies found that Interleukin-6 and Interleukin-8 could be used in diagnosing neonatal septicemia . In this study, IL-8 cutoff value 120 pg/mL, sensitivity was 98%, specificity 90%, positive predictive value 97%, negative predictive value 95% so it is a good predictor for early diagnosis of neonatal sepsis. CRP is an acute- phase reactant that doesn’t pass the placenta, and the production of which doesn’t vary with gestational age . As regard CRP, there is significant increase in suspected, infected groups as compared to control group as regard CRP with P value 0.001*. CRP cutoff value 6 mg/L, sensitivity was 54%, specificity 70%, positive predictive value 85%, negative predictive value 31%, so CRP level can be used to monitor the course of the disease as it`s concentration falls rapidly in infants responding to therapy and it is agreement with some studies . IL 6 and IL 8 are more sensitive than CRP in early prediction of neonatal sepsis so we conclude that IL 6 and IL 8 levels should be done for early detection of neonatal sepsis which will lead to early diagnosis of neonatal sepsis with early treatment and subsequent better prognosis. Borghesi A, Stronati M, Castagnoli R, et al. Novel approaches to the study of neonatal infections. Am J Perinatol 2018; 35: 570-574. Tzialla C, Manzoni P, Achille C, et al. New Diagnostic Possibilities for Neonatal Sepsis. Am J Perinatol 2018; 35: 575-577. Kim JK, Chang YS, Sung S, et al. Trends in the incidence and associated factors of late-onset sepsis associated with improved survival in extremely preterm infants born at 23-26 weeks' gestation: a retrospective study. BMC Pediatr 2018; 18: 172. Khan AM, Morris SK, Bhutta ZA. Neonatal and perinatal infections. Pediatr Clin North Am 2017; 64: 785-798. Easter SR, Molina RL, Venkatesh KK, et al. Clinical risk factors associated with peripartum maternal bacteremia. Obstet Gynecol 2017; 130: 710-717. The National Institute of Child Health and Human Development Neonatal Research Network. Pediatric Infect Dis J 2008; 17: 593-598. Brun-Buisson C. The epidemiology of the systemic inflammatory response. Intensive Care Med 2000; 26: S74-S79. Simonsen KA, Anderson-Berry AL, Delair SF, et al. Early-onset neonatal sepsis. Clin Microbiol Rev 2014; 27: 21-47. Stoll BJ. Infection in neonatal infants. In: Kliegman R, Behrman R, Jenson H, et al (eds). Nelson Textbook of Pediatrics. Philadelphia: Saunders 2007; 794- 811. Boskabadi H, Maamouri G, Tavakol Afshari J, et al. Evaluation of serum interleukins-6, 8 and 10 levels as diagnostic markers of neonatal infection and possibility of mortality. Iran J Basic Med Sci 2013; 16: 1232-1237. Barug D, Goorden S, Herruer M, et al. Reference values for interleukin-6 and interleukin-8 in cord blood of healthy term neonates and their association with stress-related perinatal factors. PLoS One 2014; 9: e114109. Hotoura E, Giapros V, Kostoula A, et al. Pre-inflammatory mediators and lymphocyte subpopulations in preterm neonates with sepsis. Inflammation 2012; 35: 1094-1101. Miller JM, Binnicker MJ, Campbell S, et al. A Guide to Utilization of the Microbiology Laboratory for Diagnosis of Infectious Diseases: 2018 Update by the Infectious Diseases Society of America and the American Society for Microbiology. Clin Infect Dis 2018. Cantey JB, Anderson KR, Kalagiri RR, et al. Morbidity and mortality of coagulase-negative staphylococcal sepsis in very-low-birth-weight infants. World J Pediatr 2018; 14: 269-273. Zhou M, Cheng S, Yu J, et al. Interleukin-8 for diagnosis of neonatal sepsis: a meta-analysis. PLoS One 2015; 10: e0127170. Goldfinch CD, Korman T, Kotsanas D, et al. C-reactive protein and immature-to-total neutrophil ratio have no utility in guiding lumbar puncture in suspected neonatal sepsis. J Paediatr Child Health 2018; 54(8): 848-854. Kumar N, Dayal R, Singh P, et al. A Comparative Evaluation of Presepsin with Procalcitonin and CRP in Diagnosing Neonatal Sepsis. Indian J Pediatr 2018. Popowski T, Goffinet F, Maillard F, et al. Maternal markers for detecting early-onset neonatal infection and chorioamnionitis in cases of premature rupture of membranes at or after 34 weeks of gestation: a two-center prospective study. BMC Pregnancy Childbirth 2011; 11: 26. Stoll BJ. Infection in neonatal infants. In: Kliegman R, Behrman R, Jenson H, et al (eds). Nelson Textbook of Pediaterics. Philadelphia: Saunders 2007; 794-811. Nakstad B, Sonerud T, Solevåg AL. Early detection of neonatal group B streptococcus sepsis and the possible diagnostic utility of IL-6, IL-8, and CD11b in a human umbilical cord blood in vitro model. Infect Drug Resist 2016; 9: 171-179. Wu YQ, Shen J, Zhou QL, et al. Interleukin-6 and interleukin-8 in diagnosing neonatal septicemia. J Biol Regul Homeost Agents 2016; 30: 1107-1113. Nakstad B. The diagnostic utility of procalcitonin, interleukin-6 and interleukin-8, and hyaluronic acid in the Norwegian consensus definition for early-onset neonatal sepsis (EONS). Infect Drug Resist 2018; 11: 359-368. Mirzarahimi M, Barak M, Eslami A, et al. The role of interleukin-6 in the early diagnosis of sepsis in premature infants. Pediatr Rep 2017; 9: 7305. Quadir AF, Britton PN. Procalcitonin and C-reactive protein as biomarkers for neonatal bacterial infection. J Paediatr Child Health 2018; 54: 695-699.